Ben Stocks, CEO of Porvair plc (left) sealing the company’s joint venture agreement with Mascot. 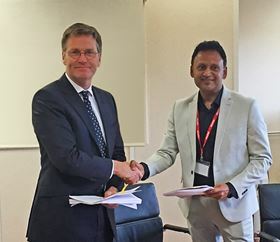 The new joint venture business will support Porvair’s ongoing activities at Reliance Industries’ Jamnagar refinery and expand the UK company’s wider interests in India. The joint venture is already contracted to provide filter cleaning equipment and services for Reliance after Porvair developed an automated machine that applies a number of dedicated cleaning stages to char filter assemblies at the refinery. The two companies will work closely together to develop new filtration business opportunities in India, based on Porvair’s range of products manufactured in the UK and USA. Porvair began working with Reliance Industries in 2013, providing advanced char filtration systems. Porvair Filtration Group manufactures in both the UK and USA and has a network of sales offices and distribution channels throughout the world.